Upon arriving at my office, I had a friend of our organization waiting on me with a teenager sitting next to them. It was obvious there was something going on, so I sat down with them to talk through the issue. It turns out the teenager wasn’t related to the adult, but the adult had a mentoring relationship with this teenager and knew their mom. In recent weeks the family situation had disintegrated and essentially this teenager was dumped on our friend and threats were made that the teenager was going to be kicked out of the house. So sitting in front of me was a well meaning adult, and an unrelated teenager who had nowhere else to go. Tough doesn’t even start to describe this situation. In fact I would argue these kinds of situations are the reason many adults don’t want to work with teenagers much outside of their own family situation. But the truth is, we need more. Teen Life has opportunities daily to interact with teenagers from all walks of life, cultural and religious background, and social status. Some have incredible families and support structures, while others have literally nothing. Some have advantage while others seem to have the world actively battling against them. But the one thing they all have in common is this – they need support and presence from adults. No matter how well off they might seem, someone has to be there for them who have lived longer and has more life experience. This cannot be replaced. Our friend was well meaning, but needed some help (and permission) to set boundaries not only with the teenager, but with their parents. Both were misbehaving badly and wanted someone to be a part of it. In the counseling world it is called “triangulation”. Simply, when people are in pain or at a loss they find someone else to project the stress they are feeling onto so it won’t hurt so bad or they won’t have to deal with the problem. Boundaries are crucial when working with anyone, especially teenagers. They teach and protect. Knowing what you are wiling to do and where you need to stop can allow for a clear path through a difficult situation. When you come upon a situation where there is stress, do everything you can to calm the stress. Find a way to create space for everyone to cool off. Go on a walk. Play with playdoh. Build something with legos. Write or draw. Listen to some music. As a helper, find a way to create safe space for clear thought. When teens and families are in a state of stress, clear communication and resolution is relatively impossible. Find a way to de-escalate and reduce the stress. Most communities have some support system in place with professionals and lay people equipped to serve vulnerable populations. Whether it be a local non-profit, faith community, or school, there is help to be found. 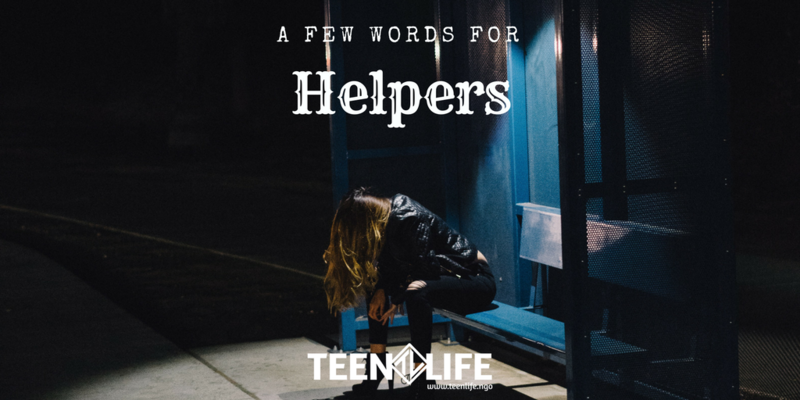 Often for the helper of teenagers, their issues and demands can be daunting. But if you know there is help available, it helps you to stick around. Typically these resources can be found either via web, call in services (like the National Suicide Prevention Hotline or 211), or by making a few phone calls to community leaders. Our experience has told us we are only a few phone calls from getting the resource we need. Don’t be afraid to make a few calls. I’m sure you are a smart person if you are willing to help a teenager but, you don’t know it all. Don’t be afraid, especially after having a working knowledge of the resources in your community, to refer to trusted sources. Bring the community in to help. Let them shoulder some of this load. What do you think about this? How have these ideas helped you in the past?